This is where your beautiful photographs come to life! It is one thing to see your photos in their digital form, and it is yet another exciting experience to see them in print. Below are some photos of the products that turn your photographs into beautiful presentations. I offer two album styles: The Classic Album (left in the photo below), and the Fine Art Album (right). Albums are the most popular boudoir product due to their elegant presentation of your photographs and your ability to tuck them away for viewing when you desire. Pictured below are a few sample products, including an open Classic Album, a few prints (size 10×15 in 16×20 mats), a Fine Art Album, and another Classic Album. 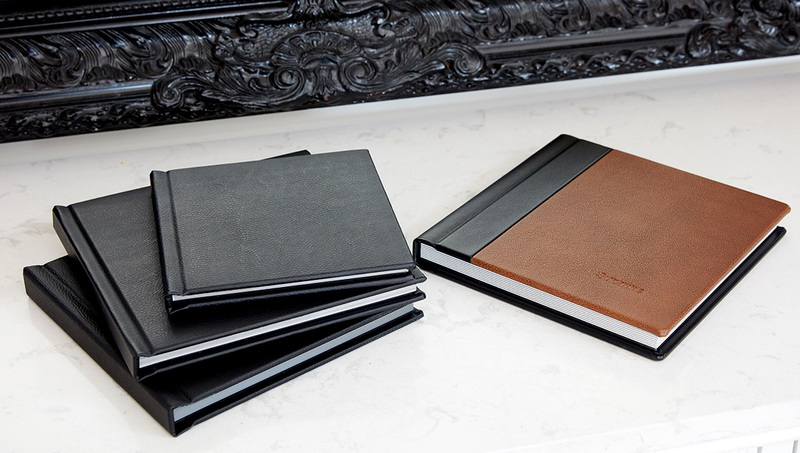 The Albums shown here are 10×10″ and 8×8″ in size. The Fine Art Album (below) is an album of the highest quality level, hand made with your choice of cover options (various leather and fabric choices), and with the highest quality printing processes available. The Classic Album (below) offers great flexibility in layout design styles while also offering a fast turnaround time. All albums (Fine Art and Classic) include a digital replica in PDF format. I offer wall art in a variety of mediums and sizes of the highest quality. Below is an framed canvas you can see at my studio. This is an extremely elegant art piece made to present your work in a beautiful, archival format. Dozens of custom frames are available for your selection. Pictured below is a metal print (left) and a set of matted and framed fine art prints. Fine art prints are produced to the highest available printing quality, and far exceed the archival life of traditional professional prints. Framing is available for all prints, with dozens of frame styles. I also offer canvas gallery wraps (not pictured) and desk prints. Images are also available in digital form to augment the products above. All album orders include a digital replica in PDF format. Individual digital photographs are available, and options are available to get digital copies of the images that make up your product order.